Say, you wouldn't throw a guy like me over a balcony at the supper club, now would ya? The Spin: The latest Winter/Van Patten hour opens in purely Sopranos-esque style with Nucky’s dream. Oh, the symbolism! Oh, what does it all mean? Where’s Dr. Melfi when you need her? What transpires next is possibly the series’ finest hour. Behold! 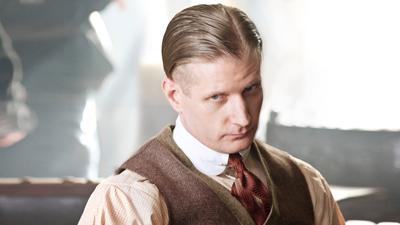 – Nucky’s old pap bites the dust. At last! – The Schroeder kids start callin’ ol’ Nuck “Dad.” Look Yonder! – It’s Torrio and Rothstein (Michael Stuhlbarg) meeting up with Nucky to discuss the little problem with their underlings. Apparently Rothstein is the 1920’s gangster version of our own modern-day Warren Buffett advising the others to wait…wait…wait…and then place the perfect bet. And then! – After his own brush with death last week, Nucky sees all the signs and tells his enemies he’s resigning and stepping down to retire with his new “wife and kids.” Oh, brutha, but even Nucky’s own dumb-as-dirt brother (Shea Whigham) knows that Nucky is smarter than Jimmy – he’s smarter than them all. And we know that Nucky is bamboozling his enemies into thinking they’ve won – as you see, he’s plotting with Chalky White (Michael K. Williams) to shut down the city with a strike and arranging for Slater (Charles Cox) to take him over to Belfast and arrange a meeting…for perhaps a little arms dealing? While pouty-lipped Jimmy is too dumb to realize his wife (Aleksa Palladino) is about to hook-up with novelist Louise, he takes out his blind frustrations by throwing the even stupider Mickey Doyle (whose laughing now, buddy?) from the balcony of Babette’s during their evening of celebration. Things Learned This Evening: Angela has always smoked. Swedish nannies are the best, aren’t they? The decor for Jersey funeral homes hasn’t changed in 90 years. Wait Until Next Week: Something tells me that Butcher from Philly could go rogue at any moment and cut him up a nice steak at the shore. How long can Sleater keep his secret? This entry was posted in Boardwalk Empire: Complete Episode Guide, Pop Culture, Television and tagged Aleksa Palladino, Atlantic City, Boardwalk Empire, Boardwalk Empire Blow by Blow Episode Guide, Charles Cox, HBO, Kelly Macdonald, Michael K. Williams, Michael Pitt, Michael Stuhlbarg, Mobsters, Paul Sparks, Prohibition, Shea Whigham, Steve Buscemi, Terence Winter, The 1920's, Tim Van Patten, TV Series, Two Boats and a Lifeguard. The animals. Is Nucky the hunted (the wounded deer) and/or the hunter (the bear)? Ambiguity concerning Nucky’s situation that will surely change with his new schemes. The poor marginalized girls: the maid loses her lover to the mistress; the little girl is sick and the doctor brushes off her symptoms giving Nucky better medical care; the lesbian lovers who are “invisible;” the nanny is basically left to work 7 days a week, 24 hrs a day; and the newborn is worse than a tree stump to her father. And Chalky is BACK. Hoorah. DHS, the father issues abound. Who is Jimmy without Nucky? It’s like being the Joker without Batman. That kid is peeling like a potato. Nutty and angry. Having some connection with his twisted father-figure Nucky keeps him a tad bit balanced. Nucky gives Jimmy a reason to live. I’m hoping Jimmy and Nucky have an (un-)happy reunion because Jimmy is at least slightly less unhappy when he is at odds with Nucky. No Nucky, no father/son angst. It is akin to breathing. in one scene jimmy is sitting with the family as if in a portrait. he’s there with his mother and the general. Nucky walks in to make his big pronouncement to the sitting portrait. jimmy is there with his biological father but Nucky eclipses the general. Nucky as FATHER? That little girl looks to be dying and he barely glances at her. And nucky grappling with his own father’s death. he’s suffering more than jimmy but at least jimmy acts out on his pain even when it is through violence. Under these circumstances, I’d rather be an orphan. Oliver Twist sure had it better. Orphan Annie trumps them all.